My last freezer cooking session, 12 Easy Freezer Meals in 2 Hours for $50 has quickly become my most popular post so I figured it was time for more recipes. This time I focused on ground beef instead of chicken and I tried to make them healthier than last time (i.e. more veggies and less cheese). I have to say that this batch of recipes was a lot easier to put together with almost no chopping and minimal cooking involved. 3. Split ingredients into two bags and freeze. 4. When ready to eat thaw overnight in refrigerator. 5. Cook in slow cooker on low for 8-10 hours. 2. Split ingredients into 2 bags and freeze. 3. When ready to eat thaw overnight in refrigerator. 4. Cook in slow cooker on low for 8-10 hours. 2. Split ingredients into two bags or foil pans and freeze. 3. When ready to eat let thaw overnight in refrigerator. 4. If you used a freezer bag then pour into greased casserole dish. 5. Cook for 35 minutes at 400 degrees or until center is hot. 1. Cook ground beef (preferably the night before). 2. Cook noodles, drain and let cool. 4. Chop onions for chili. 5. Open all cans with can opener. 6. Assemble meals splitting each recipe into two bags. 7. Freeze flat and enjoy your meals! I hope you enjoy these meals and I would love any feedback you may have for future reference as I plan to do more freezer cooking sessions soon. What types of recipes do you prefer? Are easy, frugal and healthy recipes important to you? Thanks so much! I like how you do...well do-able freezer cooking. It makes me want to try this. I WANT to be the Sunday: Church Farmers Market 10 hour freezer meal prepare r But God apparently did not make me that way. Thanks again for the inspiration! Thanks so much for the ideas! I love making weeknight cooking easy, and this is the way to do it! Do you have a problem with the pasta being soggy once it's cooked? I know sometimes when I make soup that has noodles and then freeze it to pull out another day it gets huge and soggy and flavorless. Just wondering if this is the same way or if it works out better since it is cooked alone and cooled. Also, do these meals feed 4 adults like your others do? Thanks! I have not had problems with freezing pasta in casseroles, but I wouldn't add pasta to crockpot soups because it would turn out soggy. With those types of recipes I normally wait to add the pasta right at the end. I'm going to make up a bag of #2 the beef & veggie soup. I've also heard it called Cowboy Soup - kids get a kick out of that name. Just a thot - you can lower the sodium content by not adding the canned corn and also avoid the aluminum can taste/toxicity if you either use a 1/2 cup frozen corn or don't add it at all. Likely there is already corn in your frozen mixed veggies. :) I'm going to go check out your other freezer post. This is so funny. I just found you from the Craftaholics Anonymous link party but I had just pinned your 12 freezer meals post this morning. I love that! 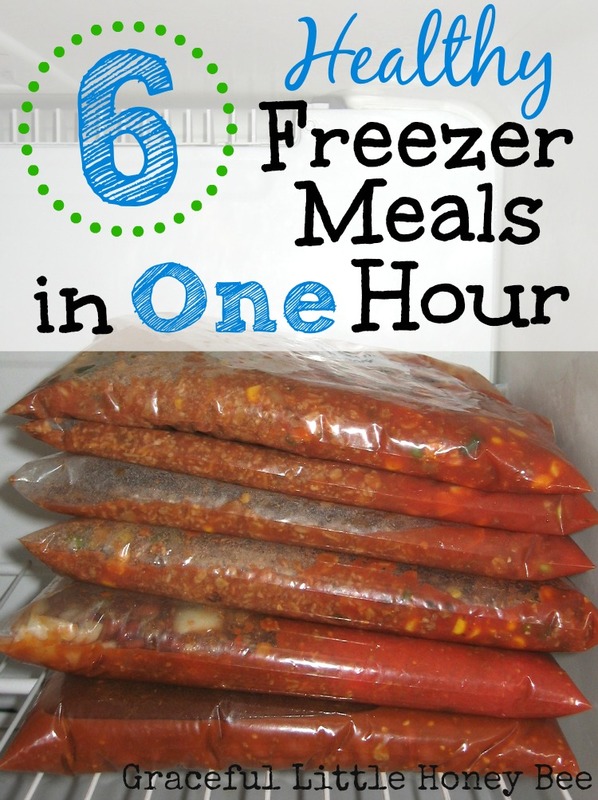 Thanks for this I am needing to get on the ball and create some make ahead freezer meals. Been pinning them like crazy. I like the healthier options too. Thanks for these recipes! I'm going to try this since I have a houseful again with my daughter's family living with us for a while. Your recipes sound great and have easy to follow directions for freezing. I never tried this before! I really like your format, too. It's so easy to copy and paste into my recipe files. These sound great! Thanks for sharing the recipes and freezer cooking plan. I need to get back on track with my freezer cooking and this would be a good place to start. Can you just pull from the feezer and put it straight into the crockpot the day you want to cook it? Or do you have to thaw it first? I would suggest putting it in the fridge the night before so it has a chance to thaw some. You will need it to be thawed enough to to be able to dump it in to the crockpot. I am just now discovering the awesomeness that is freezer meals. Where have they been all my life?! :-) I am bookmarking/pinning this post for sure because I want to try out these recipes! Thanks for the great resource! How many servings would you say are in "one meal"? Each meal would probably feed 4 adults. We feed two adults and two toddlers with leftovers. Thanks for your work in putting these together. We are missionaries in Africa, hence, we do not get boxes and cans of ingredients. Can you list the ounces of the ingredients for those of us who do things from scratch or get food in different sized containers? Thank You! For years, I've been putting oats in my meatloaf and meatballs because it makes infinitely better dishes that breadcrumbs or soaked bread methods, but it never occurred to me as a way to stretch hamburger. Thanks for the great idea. Also, we don't currently have any Aldi's in our area (although they say they are coming soon) and was wondering what do you pay for a pound of hamburger from there. I currently buy my hamburger in a 10 pound pack from Smart and Final when it goes on sale at 1.99 a pound. Is it cheaper than that? Also, excellent blog! I'd say you are getting a great price. I think the bulk packs at Aldi are around $1.99 too. Thank you for the great recipes and putting them out there for us busy parents. Easy, frugal recipes are the best and if you find any more, they would be greatly appreciated. Higher protein meals would be great since we have boys that eat us out of the house. Please share if you come across any. Thank you for your time and for sharing! These are awesome ideas! Thank you so much for your time in making them so easy to prepare! I made all three when I was getting prepared for a week long business trip and it made it so easy for my hubby and kids to still have good healthy meals while I was away. Instead of the fast food and tv dinners that are so unhealthy and unsatisfying. Bless you for the work and time you put into this! I look forward to more ideas! Would love some ideas using pork loin and chicken breasts.